COIN ELITE for Windows offers a powerful built-in Inventory Browse that allows you to add, view, edit, print, summarize, query for all coins in the Coin Type (ie. Barber Dimes, Buffalo Nickels) or just a selected group of coins within the Coin Type. You can also create upto 11 Sub-categories in each Coin Type. The picture below shows two created sub-categories named Raw and Slabs for Morgan Dollars. 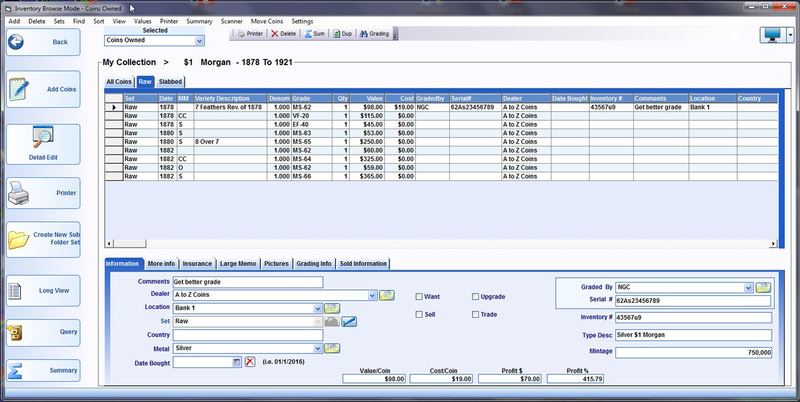 The Inventory Browse is where you add, delete or change information about your coins. The Inventory Browse lets you add coins to your inventory (Add Coins feature) from our built-in descriptions and values by clicking on a date and a grade(see Automatic Typing feature). Coin Elite also offers a way to manually add coins which is useful for adding world coins or rare varieties. 1. The screens can be sized and permanently saved. 2. 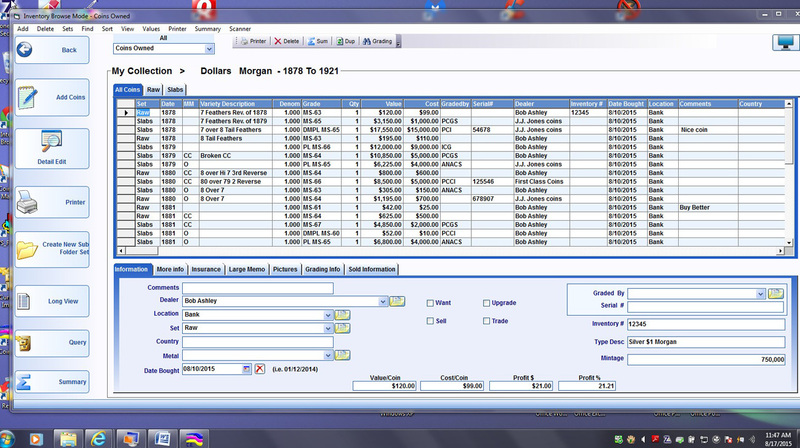 The Browse table columns can be rearranged in any order and the order permanently saved. 3. The widths of the Browse table columns in all Browse tables can be sized and saved permanently too. 4. Font sizes in all browse tables can be changed and saved permanently too. Viewing the created Sub-set named Raw . By clicking on the tab(Raw) Coin Elite sets itself and all features to only working in the sub-set that is selected. Great for when you have multiple albums or sets of the same Coin Type and you want to list them separately. Viewing the created Sub-set named Slabs. By clicking on the tab(Slabs) Coin Elite sets itself and all features to only working in the sub-set that is selected. Great for when you have multiple albums or sets of the same Coin Type and you want to list them separately..